Mesh or Solid Cover protects your pool and Loved one from potential harm. Custom available. Protecting children from drowning or becoming submerged in a backyard swimming pool requires more than just a single safety device or barrier. Read more about different pool safety devices and barriers in this informative article. One of the most crucial safety devices any swimming pool owner should have, though, is a Safety Cover. 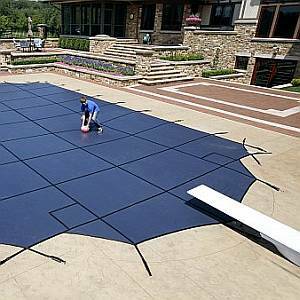 Please note that solar pool covers and winter pool covers are not safety covers. The American Society for Testing and Materials (ASTM) F1346-91 standard (1996) requires that a pool cover be able to hold a minimum of 485 pounds per five square feet in order to qualify as a safety cover. Drowning is the second leading cause of death for children 1-14 years old, according to the Centers for Disease Control and Prevention, and an extensive study performed by the Consumer Product Safety Commission (CPSC) found that "75 percent of the children involved in swimming pool submersion or drowning accidents were between 1 and 3 years old." We are proud to offer quality Safety Covers made by Arctic Armor in the standard Blue and Green colors, and some models are available in Gray, Tan or Black. Safety covers usually come in two varieties: Mesh and Solid. Both types of safety covers are anchored to a deck with straps that pull the cover taut over the pool; the straps usually attach to stainless steel springs and are anchored to recessed brackets in a deck surface. When the cover is removed, deck brackets that are not already flush with the deck can be screwed down to prevent tripping or toe-stubbing. Because the straps need to be anchored down, mesh covers generally require at least two to three feet of decking all around the pool. 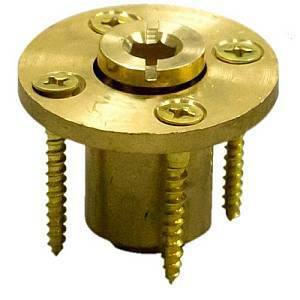 There are a variety of deck anchors for all types of decking material including, but not limited to, concrete, brick, asphalt, earth, and wood. Mesh covers are designed for long-term use, such as when closing a pool for winter. Mesh covers require little maintenance because debris that lands on them blows off the top, and rain and snow drain through the mesh panels; however, with the screen-like material of mesh, some silt and dirt may get through the webbing. 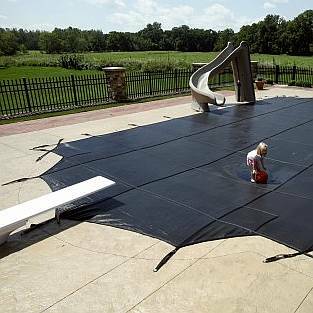 On the other hand, because puddles cannot accumulate on the surface, having a mesh-style safety pool cover eliminates the risk of toddlers or pets unexpectedly coming in contact with shallow water. Mesh covers are usually lighter than solid covers so can be easier to put on or take off you pool. Solid covers work similarly to mesh covers in that they can be secured to a deck by anchors. Solid covers may not be best for use in areas that receive heavy rain or snowfall. Unlike mesh covers that allow water to drain through the cover, precipitation can accumulate on a solid cover, creating a puddle of water over the pool. The collected water may tend to sag the cover and present a hazard to any small children or pets who, if unsupervised, wander onto to pool cover. To combat this problem, manufacturers either incorporate mesh drain panels into the covers or require an automatic cover pumps that automatically pump water off the cover as soon as it is detected. All premade rectangle solid safety covers are made with a mesh drain by default. Read more about How to Maintain Your Safety Pool Cover in this informative article. Webbing: On top and bottom around the perimeter. Field is reinforced J-seams sewn with webbing on top only. * - Manufacturer has never published UV specs. Estimated only. Algae may not be retarded without chemicals. Important to Know: It is usually less expensive to purchase a rectangular cover that will cover your non-standard size pool or irregular shaped pool. But what most dealers will NOT tell you is that this will void the warranty with the manufacturer. This is true for ALL manufacturers of safety covers. So please keep this in mind before ordering a rectangle cover for your Grecian, Roman, Oval, or any other Freeform pool. 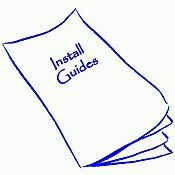 Find helpful tips on Swimming Pool and Spa Equipment, Maintenance, and Safety. Please click on your size pool to see all available covers and pricing.